Recently, I have been in a mood to watch zombie-themed films. Over the past few weeks I have taken in several selections from this genre and I have noticed a few trends that I would like to share. Zombie films overly exaggerate our propensity for sympathy. While I am all about concern for another human being, that concern tends to be dependent on whether or not the other human being is currently devouring a jogger or the FedEx guy. Despite the fact that our newspapers are inundated with stories of callous disregard for imperiled fellow humans in real life, during a zombie outbreak the entire human populace apparently becomes Mother Teresa. 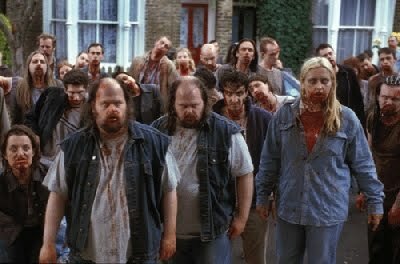 People in zombie films are disturbingly unaware of their necks. This is almost universal and seems to run contrary to human nature. The placement of one’s teeth on the flesh of a fellow person’s neck (provided that they are conscious) is an exceedingly difficult feat to accomplish without consent. This is due to both the awkward angle the attacker’s head must assume and the fact that most people instinctively raise their shoulder to prevent such uninvited contact. If you disagree, I invite you to approach a total stranger and attempt to give them a hickey. You will quickly notice that this is a difficult task even without an alien virus ravaging your delicate central nervous system and the stench of death giving you away. On a side note, I believe that Christian Slater may still be in court over a similar experiment. Changing into a zombie adversely affects your wardrobe. In almost every instance where a person is bitten by a zombie, the articles of clothing they have on become instantly tattered and overly soiled. I will grant you that some of this is due to the bloodletting that often accompanies such a change. However, this does not account for the split pants and torn shirts, especially when these fabric breakdowns occur in areas unmolested by the virus-deranged aggressor. One minute, a woman is wearing a stylish purple blouse with a plaid skirt and heels, and two minutes after she is bitten her shoes have gone missing, the blouse is ripped in four places, and her skirt looks as though it has survived an eight-month old shipwreck. I realize that fabric durability has taken some hits lately but I see nothing wrong with giving Old Navy the benefit of the doubt. Posterity always seems to trump self-preservation. The most recent example of this is the film Quarantine, in which the central characters are members of a local news crew. This is utilized as a plot device allowing the film to be presented to us in a first-person perspective (i.e. as the cameraman sees it). Situations like this tend to be sensible at first, but after you have documented a dozen people eating each other in rapid succession, most of us would choose to remove the tape and leave the fifty-two pound camera behind. As Guy #4 approaches news crew he is attacked and eaten by zombies 6 &11 as Camera Guy Gary continues to film. Again, I think we can all agree that there is inherent value in first person footage of unusual occurrences. It seems unlikely, however, that a normal person working part time for a local news channel is going to risk his life in order to obtain footage that will likely be edited down to an 8-second montage used to kill time before the local meteorologist checks the forecast for the sixth time. The Idea of Natural Recovery is Ignored. 1. Violently murder everyone infected that you come in contact with. 2. Create an artificial cure. I always thought it would be funny to begin a zombie movie with the typical premise of a band of survivors who is forced to maim, beat, and generally slaughter everyone in their entire community. Only later is it revealed that the zombie virus was a five day sort of bug. Other than lingering dehydration, the infected had no long term problems and would have made a full recovery had they not been killed prematurely by the band of survivors. The medical approach taken by most zombie films is the equivalent of going to a doctor’s office with the world’s first case of the flu and the staff decides it is best for humanity that you are shot in the face before they try Tylenol and a few days of observation. Granted the flu does not normally lead into cannibalism, but after four hours in the waiting room with a 100 degree fever the boundless aggression is certainly there…..